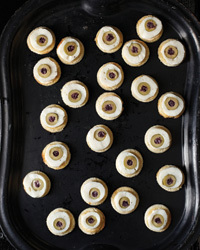 Looks like eyeballs tastes like fish, need we say more? Though might sound like a DIY bush tucker trial, this canapé is deceptively delicious and will kick the sophistication of your no doubt zombie-themed soiree up a notch or two. In a food processor, combine the scallops, egg whites, salt and white pepper and blend until smooth. With the machine on, add the cream in a thin stream. Scrape the puree into a bowl and refrigerate until chilled, about 30 minutes. Tear four 12-inch sheets of cling film. Spoon 1/4 of the puree onto each sheet in a 6-inch square. Slide the green olives lengthwise onto four 6-inch wooden skewers. Lay one skewer down in the center of each square. Roll the puree around the olives skewers and tightly roll up the cling film to form cylinders; twist the ends and secure with twist ties. Wrap each cylinder in another sheet of cling film and refrigerate until chilled, about 30 minutes. Bring a large, deep frying pan of water to a simmer. Add the cylinders, cover with an inverted heatproof plate to keep them submerged and poach over moderately low heat until firm, 15 to 20 minutes. Let cool, then refrigerate until completely chilled. Crush the garlic with a pinch of salt in a medium mixing bowl. Whisk in the mayonnaise, paprika and lemon juice, then whisk in the olive oil in a thin stream. Preheat the oven to 180 degrees (gas mark four). Brush the bread on both sides with the melted butter. Using a 2-inch round cutter, stamp out as many rounds as possible from the bread. Transfer the rounds to a baking sheet and toast until golden, about 15 minutes. Unwrap the cylinders and remove the skewers. Using a sharp knife, cut the cylinders into slices about inch thick. Place a piece of black olive in the center of each green olive. If desired, use a slightly smaller round cutter to stamp the mousse slices into perfect rounds. Spoon the sauce onto the toasts, top with the mousse rounds and serve.